Oregon Dunes National Recreation Area has a fair amount of trails, mostly quite short, accessed by trailheads next to US 101 or along the few side roads leading to the coast. 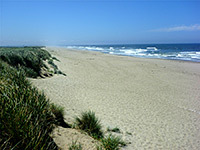 Cross-country hiking is possible along the beach and over the sand dunes, though the creeks, marshes and thick forests restrict opportunities in other areas. Starting in the north of the NRA, several paths begin along Siltcoos Beach Road. The half mile Lagoon Trail (#1330), runs around the rim of Lagoon Campground, offering views over a peaceful freshwater lagoon (once a bend in the river); the west side is still filled with open water, producing nice reflections of the neighboring trees, while the east side is overgrown. 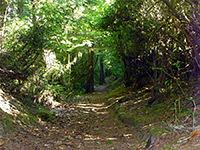 The nearby Stagecoach Trailhead is the start point for the half mile Chief Tsiltcoos Trail (#1359), looping through an adjacent section of the coastal forest, with one viewpoint of the ocean. Starting from Waxmyrtle Campground, Waxmyrtle Trail (#1337) is a 0.9 mile route through woodland on the south side of the river, past a small lagoon and out on to the beach, which is fairly narrow at this point but becomes much wider to the north, around the mouth of the river. This area is closed from May to September during the snowy plover nesting season. 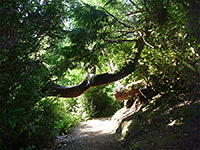 The next two paths are a short distance south along US 101; Taylor Dunes Trail (#1335) winds through spruce/fir woodland, rhododendron groves (flowering from April to May) and marshes near Carter Lake, while the linked, 1.5 mile Carter Dunes Trail (#1384) heads due west, through a big sandy area then a strip of coastal forest to the Pacific. Similar scenery is encountered on the popular, 3 mile Oregon Dunes Loop Trail (#1334), starting at Oregon Dunes Day Use Area - at the end of a very short side road, and worth visiting even if not hiking for the wide ranging views across dunes and woodland. This is one of the few places near US 101 where the ocean is in view. 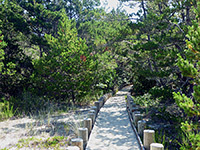 The best area for hiking in the national recreation area is around Tahkenitch Creek, where four interconnected paths traverse big dunes, dense inland deciduous forest and thinner coastal pine woodland, leading to remote beaches, a lake and the estuary of the creek. Tahkenitch Creek Trail (#1336) follows quite close to the creek and reaches the beach after 1.8 miles. Tahkenitch Dunes Trail (#1353, see below) is through a more extensive part of the inland forest then over open, parabolic dunes, followed by shore pines and the beach, after a junction with the Tahkenitch Creek route. The longer Threemile Lake Trail (#1338) and Threemile Lake Trail South (#1356) head further south to a remote backcountry lake, through generally more wooded land with smaller pockets of sand. An excellent six mile round trip can be made by taking the Tahkenitch Dunes Trail to the beach, walking south over the sands for a mile and returning via the Threemile Lake Trail. The remaining few footpaths are south of the Umpqua River. The Hall/Schuttpelz Lakes Trail (#1357) is a short route through woodland to two small lakes, bordered by sand on the west side, at the edge of the largest dune field in the NRA. The path continues into the dunes, climbing high enough for a view of the ocean. The nearby John Dellenback Dunes Trail (#1339) is a more strenuous path of 2.7 miles, initially through the forest then over the soft, shifting sands - some of the tallest dunes anywhere - all the way to the beach. The final hiking location is in the far south of the NRA, along Horsfall Beach Road; the partly boardwalk Bluebill Trail (#1331, 0.8 miles) loops around a small lake (dry at some times of year), which is surrounded by trees on all sides apart from a sandy area to the southwest. The Wild Mare Horse Trail (#4500) starts a little further down the road and heads southwest, through alder/spruce forest then grassland, ending at the beach after just less than a mile. This path is a good choice if hiking just one route since it is relatively short (2 miles), not busy and encounters a good variety of environments, including dense forest, sand dunes, coastal pine woodland, beach and estuary. Parking is beside Tahkenitch Campground, just off US 101, in a clearing surrounded by cool, shady forest. An information board at the trailhead shows a map of the route, and the area on the beach not to be entered during the snowy plover nesting season. 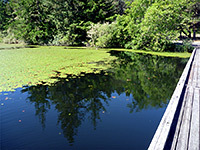 The path is wide and well established, leading up a gentle gradient southwards, staying close to the edge of the forest, offering some views of an lily pad-covered pond, but also subject to traffic noise from the nearby highway. A junction is reached after ten minutes walking, from where the Threemile Lake Trail continues south, while the Tahkenitch Dunes Trail turns northwest, still climbing a little, and moving well away from the road, through dark woodland of closely spaced spruce and fir trees, mixed with ferns, moss and bushes. The forest ends abruptly, replaced by open, light colored dunes, and the path descends, crossing half a mile of sand and entering secondary pine forest, much less overgrown than before, then reaching a second junction, with the Tahkenitch Creek Trail. The creek is visible ahead, flowing north to south and so preventing beach access at this point, but this is possible half a mile south, following the trail as it curves round the lower end of the stream and comes out to the driftwood-covered sands. The nesting area to the north is fenced off but otherwise there are no signs of any human interference with the landscape. The sands are somewhat featureless; wide, even, and bordered by an unending line of dunes in both directions. The land slopes very gradually, so low tide reveals a wide band of muddy flats.